Fix OSX error due to wxPython library. Now uses the Google Finance service to retrieve updated data. A new version of the open source Mna Currency Converter is available. And now also with MS Windows bundle, an OSX .app bundle. Special thanks to Ljubisa Gavrilovic for this and the feedback for the OSX UI optimization. Selection for the Precision of the result, with 2, 4, 6 & 8 decimal digits. Network traffic minimized, by determine when need to retrieve fresh data. 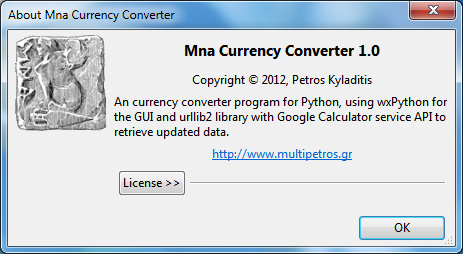 Mna is an open source currency converter program writed in Python using the wxPython library for the user interface and urllib2 library with Google Calculator service API to retrieve updated data. The program supports convertion for 87 currencies. Also, program uses the local storage and create a file, called “mna.cfg” to remember the last selected currencies and at the next start set selected them by default. To work this feature sure that you install the program at a folder in wich you have priviliges to write. Mna distributed under the FreeBSD License, with the main script “mna.py” packed in archive or in portable binary format (wich include all nessesary libraries) as standalone program for MS Windows systems, without the Python and wxPython installed, or for MS Windows with Python & wxPython as archive with script runner. Also, if you are intresting to package Mna for other systems etc. OSX with utils like pyInstaller etc. you are welcome and contact with me to get the appropriate credits on the program’s home page.